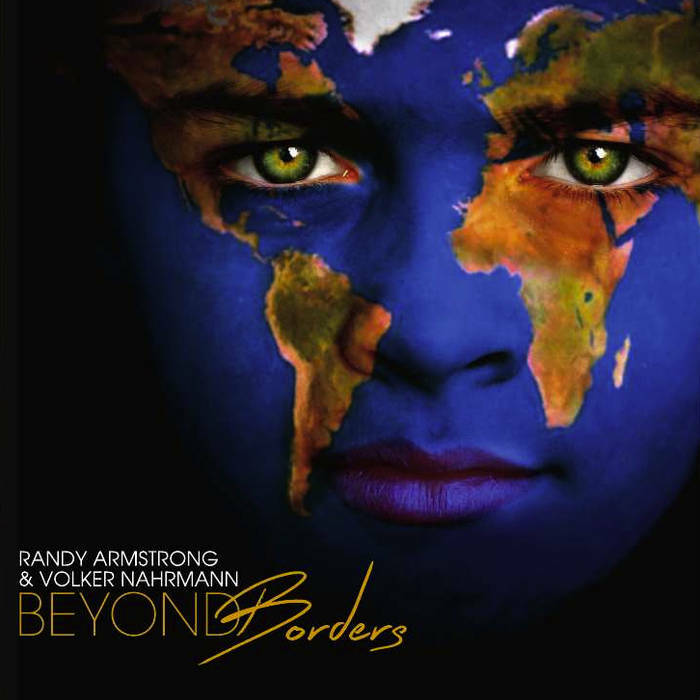 Randy Armstrong & Volker Nahrmann have released a jazz world fusion album that reminded me of why I fellin love with jazz back in the early eighties listening to Al DiMeola, Jean Luc Ponty and Stanley Clark. Those artists showed me the way and invited me to explore a complex genre of music that offers a journey that never ends. With Beyond Borders, one of many releases that this duo has brought to the masses over the years, they have reestablished their place in the world of music. Several songs on Beyond Borders are tributes to jazz legend Dizzy Gillespie, sitarist Pandit Ravi Shankar, and Beatle George Harrison. I do not use the term world lightly; if you look at the fascinating and expressive cover it says it all for these artists. To me,the cover conveys that we are one people on this vast globe and music can unite us. So, let’s try to make our own music as a sentient race and make this a better place to live. This of course leaves the door open to your own personal interpretation and that is the beauty of such a stunning work of art as portrayed on the cover of this CD and all the music that it contains. As quoted from the artist page “Beyond Borders is considered their “Magnum Opus” featuring a collection of songs composed over a 40-year span of creative output, dedicated to the belief that music has the power to uplift the human spirit and be a catalyst for change in the world.” I think that puts it all into a proper perspective. The term jazz world fusion comes into perfect focus with the opening track “Ciao Bella” (which was featured on Rate The Tracks). In Italian it translates to "Hi/Bye Beautiful," and what a hello it is. The first time I heard the sitar in popular music was back in the 60s when George Harrison introduced it into The Beatles music. I cannot say it is an instrument that fascinates me like some others however in this particular case I was amazed how beautiful and appropriate it sounded in “Shanti Om,” the dedication to Harrison and Shankar. It is one of the best tracks on the recording. The myriad of instruments employed throughout this project make it one of the more eclectic listens of the year. There is something to take into account regarding the flow and energy in life, it is crucial to the balance of the body, mind and spirit. With that in mind I realized after a few listens to this captivating album that this brought this concept to the forefront of my consciousness. “White Cloud Black Thunder” is another prolific change during the course of this album. It is a reminder of from whence we came and encourages us to honor our Native American brothers and sisters that gave us so much while receiving so little during the development of our great nation. It serves as a rain dance of life with tribal beats and chants accompanied by music that will mesmerize you. For this listener Beyond Borders was like a guide to syncing my soul with my surroundings and finding more appreciation for the beauty of the human spirit and how Mother Nature can be one with us. The key is that we honor her rather than interfere with that delicate balance and synchronicity that is necessary for a spiritual partnership, one that has always been there. All of that and more can be discovered in the music, it invites you and cajoles you into a perfect blend of sound and textures that bring you to another place that is pure and feels right. In essence everything about this release reaches Beyond Borders, in fact any lines in the sand or self-imposed restrictions melt away, they all disappear after one listen. Randy Armstrong & Volker Nahrmann have created a masterpiece of jazz world fusion that will surely receive high praise for quite some time.